By way of celebration Ayrton will introduce a new line of luminaires at Prolight+Sound with product names that evoke the winds of the world. The new names symbolise the lightness embodied in the fixtures, along with the fluidity of design and breath of innovation that Ayrton brings to the marketplace of entertainment lighting. The first luminaire in this new line is a technological marvel called Merak™ which will make its debut at Prolight+Sound 2017. Forever pushing the envelope when it comes to innovative technology, Ayrton has developed Merak as a compact wash fixture that combines punch with enhanced performance. Its new design squeezes a whole lot of washlight into a package that is less than 40cm high, with a new 250W RGBW multichip LED module and Fresnel lens, to create a mono-source luminaire that is a marvel of ingenuity. Merak signifies the first embodiment of Ayrton’s new, sleeker design motif that exhibits perfectly straight yoke arms and minimised base enclosures that house highly efficient miniaturised power supplies – Merak’s base box fits its high-tech, 400W power supply into a package just 20cm wide by 5cm high! 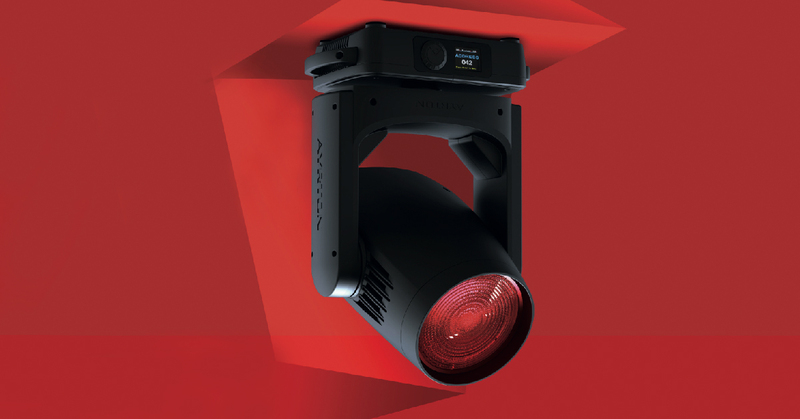 It is a powerhouse of technology that features a proprietary 10:1 optical zoom system, combined with a 250-Watt low-etendue, RGBW multichip LED module. The 7° to 70° zoom employs light pipe technology paired with a new Fresnel lens design to ensure perfectly homogenous colour mixing regardless of beam angle. With its single-source transmitting lens, Merak™ casts wonderfully crisp light and just one shadow. The second new arrival at Prolight+Sound is ArcaLine™3, the latest product in the Static Luminaire range. With ArcaLine™3, Ayrton’s ArcaLine™ unit has had a total makeover, making V.3 a refined fixture that produces outstanding results which are even more attractive to event suppliers. Each ArcaLine 3 fixture now consists of two distinct parts: the tubular optics and a slender base that houses the electronics, with stabilizing feet at either end. The one metre-long linear luminaire houses 12 RGBW LED emitters that can be controlled point-by-point. It has a new 45 mm collimator that projects an 8° beam angle – narrowed from the 12° found on previous units. The new lens employs a rosette pattern, to decrease the diffusion of light energy and concentrate it. The result is a vastly improved colour mix, combined with an increased centre beam intensity. Each can be controlled separately to create virtual tableaus or to highlight scenery on stage, while the improved stability make it ideal for floor mounting downstage or on a drum riser, or for use as a component of scenery. To facilitate set up for event suppliers, Ayrton has made the new ArcaLineTM3 configurable directly from the touch screen on the base, while small straps running along the rear of the fixture make cabling easier than ever. And if that wasn’t enough, ArcaLine™3 is rated IP65 - so essentially, weather proof. 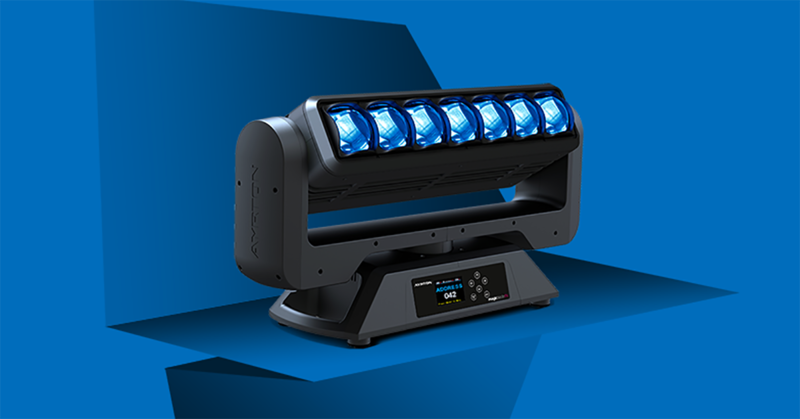 Last, but most definitely not least, Ayrton has chosen Prolight+Sound for the official launch of its new MagicBlade-FX fixture. With MagicBlade-FX Ayrton expands its Creative Solutions line of graphic beam projectors with a unit that combines the qualities of its award-winning MagicBlade-R and originality of MagicPanel-FX to become the epitome of elegant versatility. 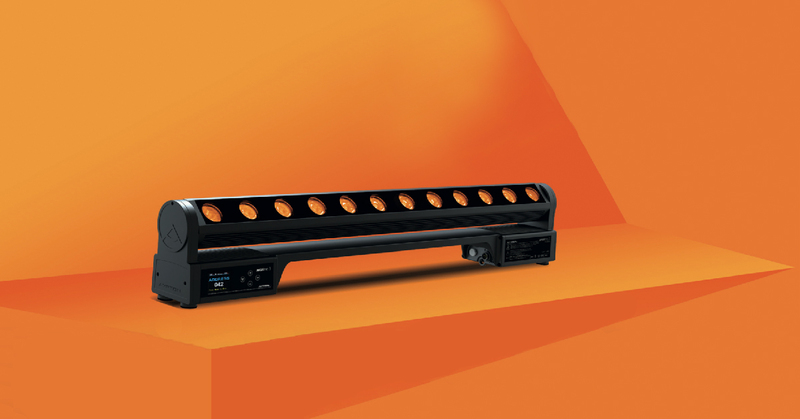 The versatile MagicBlade-FX linear luminaire is fitted with seven of the distinctive squared output 65mm fixed frontal lenses found on MagicPanel-FX and shares the same quality of colour mixing and versatile effects: 3D volumetric projections, variation between the colour-rich luminescent face or separated points of light... with ultra-tight beam projection or wide angle wash from a unique zoom system with no visible moving parts. MagicBlade-FX features a state-of-the-art short-stroke zoom with a 15:1 ratio for a wide zoom range from 3.5° to 52°. The zoom has no visible moving parts and, fronted by its squared frontal lens, generates seven fat beams that zoom to increase the visual impact of light that appears and disappears when programming 3D effects. This optical system allows designers to create an exceptional colour mix with visually sophisticated results through direct control of the RGBW chips of each emitter. Multiple colour effects can be achieved point by point. MagicBlade-FX has the same form factor as MagicBlade-R, so can be integrated into a rig just as easily, and uses the identical control protocols: DMX-512/RDM, ArtNetTM and wireless DMX via an on-board LumenRadio receiver with external antenna. Ayrton will be exhibiting at Prolight+Sound in Hall 3.0 Stand G81, alongside its German subsidiary, VisionStage, (Hall 3.0 Stand G84), where they will welcome visitors in a 280sqm stand with 180sqm dedicated to showcasing the new products. A display of 360 fixtures will feature the new products Merak, MagicBlade-FX and Arcaline™3, and products which were first previewed at the 2016 show such as MagicDot-SX, MagicPanel-FX and MagicBurst™. Noted French lighting designer, Stéphane Migné, the man responsible for designing most of Ayrton’s famous online product videos, has designed Ayrton’s demo light show once again, with the assistance of programmer Arnaud Pierrel on the console. It promises to be one of the highlights of the show, especially judging by the crowds that are drawn to see it each year. As a Lighting Consultant, Fons represents FACE's professional lighting solutions in The Netherlands. He can rely on years of experience in the entertainment, theatre and rental industry.